The past few days the theme seems to have been all about tide rips and timing, flotsam and jetsam, and of course one very special birthday! 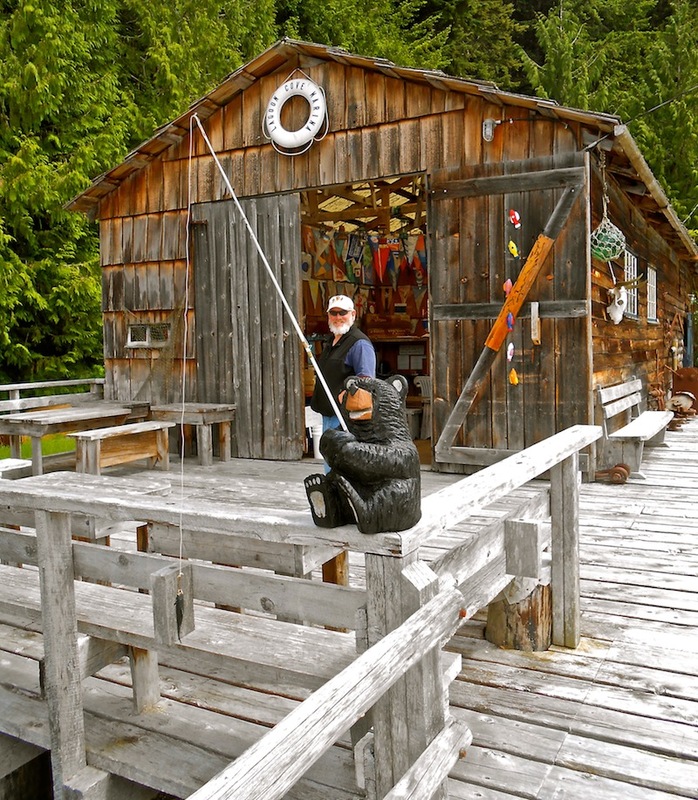 We left Campbell River late on Thursday in order to catch Seymour Narrows at slack tide, turning to ebb. In other words, we needed the tide to be turning from coming in to going out so that there wasn’t a huge current, and then we wanted to catch the ebb tide (going out) so that we could ride that current north. The currents in Seymour Narrows are notorious for their power (up to 16 knots!) and for the whirlpools they can stir up. Think Deception Pass on steroids. 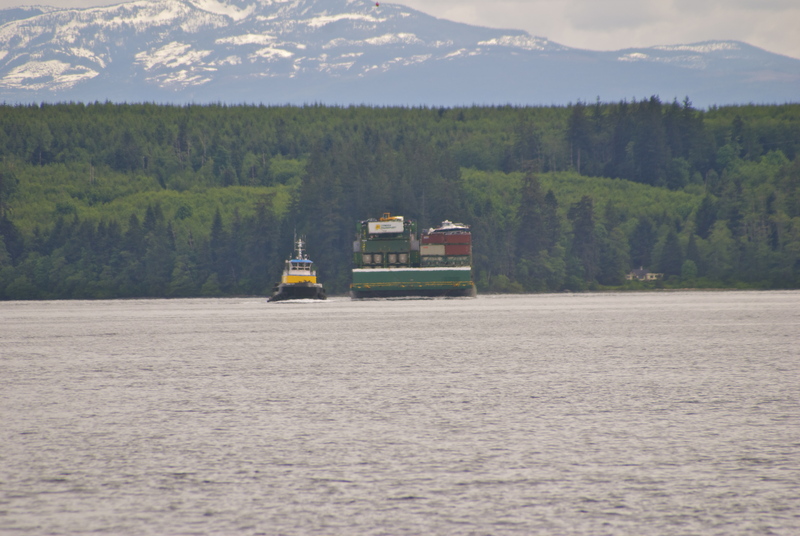 We watched four sets of tugs with huge tows go through, and it was quite a sight. 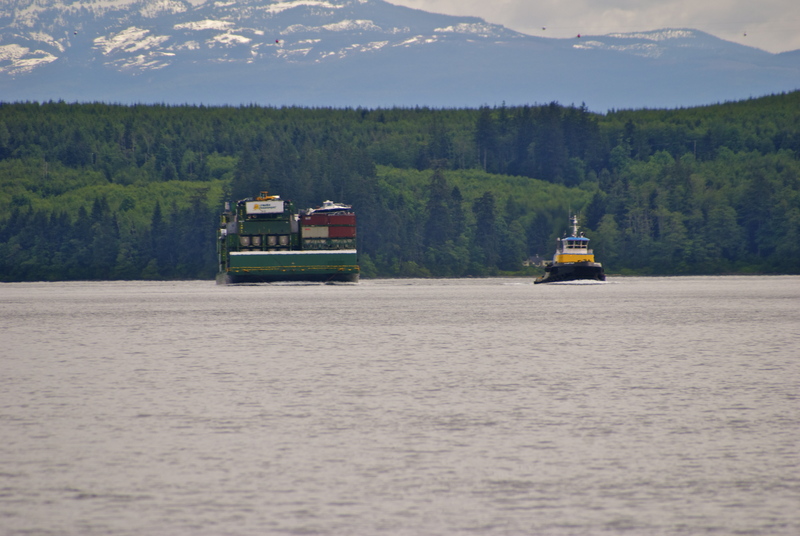 The southern turn into the narrows forces the tugs to do some maneuvering so that their tow doesn’t go sideways on them. We had a battle to get to the narrows, because we were going against the current, but we arrived right at slack and then zipped up the strait with the current pushing us – sometimes as much as 10 knots. We had to deal with plenty of tide rips (where opposing currents meet and cause a general area of “oh sh*t! ), whirlpools and back eddies so it was a wild ride up the strait. 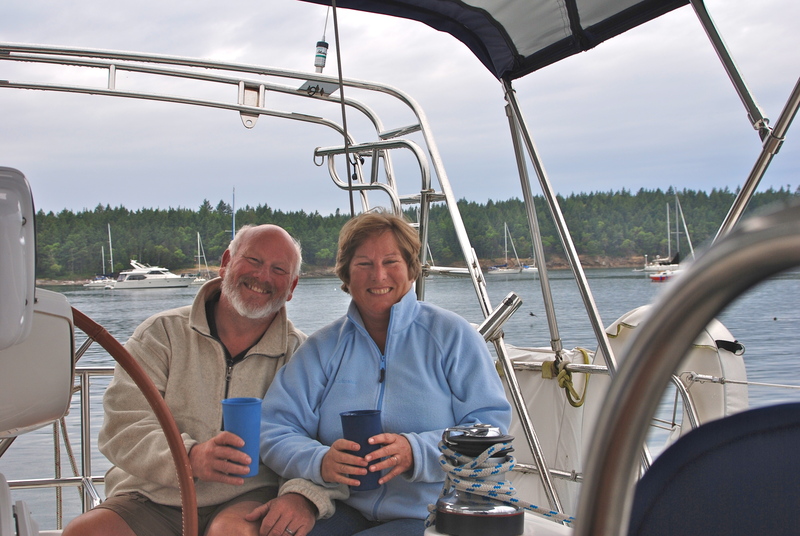 We were happy to drop anchor in Thurston Bay around 8pm. 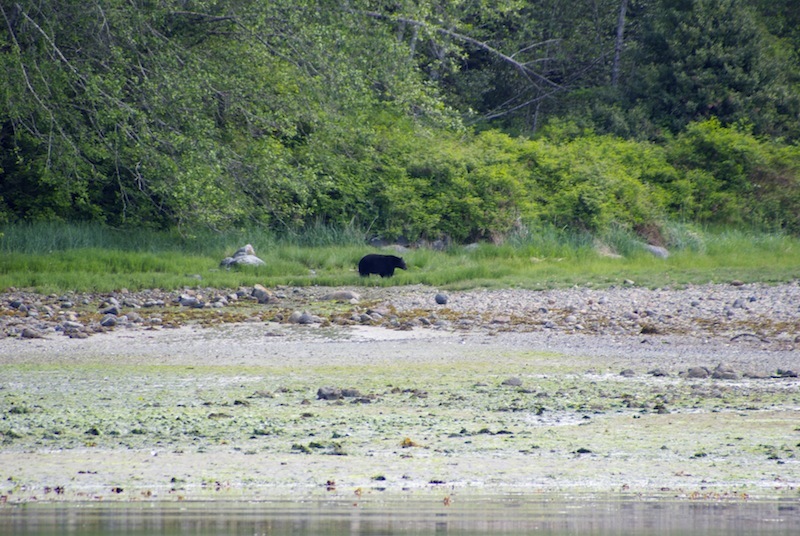 The first thing we noticed was a very large black bear on shore, happily (at least I think he was happy!) munching on the fresh grasses on the shore. Seems that when they first come out of hibernation they have to eat salad for awhile until their tummies can digest heavier foods..ha! Friday was someone’s birthday, so we enjoyed a relaxing morning of S’day coffee (Freshly brewed Arabica enhanced with Baileys!! Yum!!!) and some wildlife viewing from the cockpit. Our resident birthday bear came back to graze for a while, along with an eagle, some geese with goslings, seals, and a hummingbird that came into the cockpit and had to have help to find his way out! 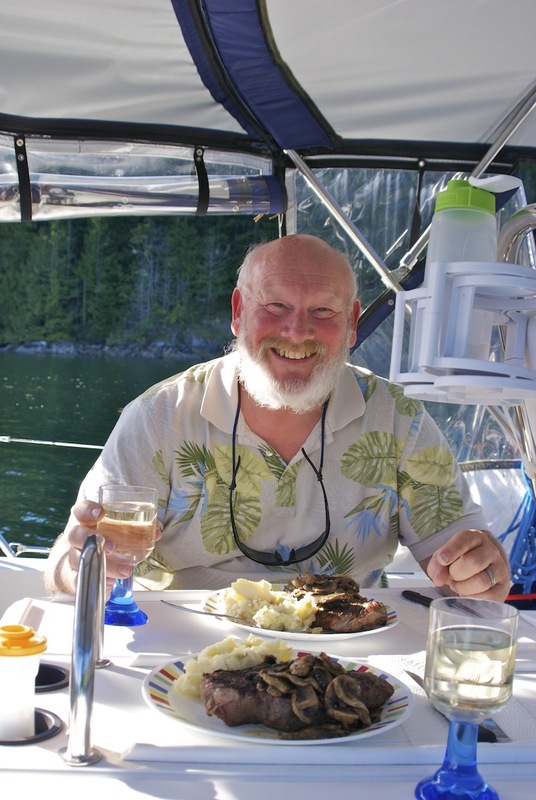 We had a lovely kayak day, followed by birthday steak and mushrooms on the veranda…not too shabby! Happy Birthday to my loverly hubby…he’s the BEST!!! Johnstone Strait was our next challenge, as it can get pretty nasty if the winds and currents oppose each other. We timed it well though, and left early on the ebb tide when the winds were fairly calm (since they were of course right on our nose and directly against the current). Around noon it started getting pretty lumpy so we decided to tuck into Port Neville for the night. As we were nearing the anchorage we spotted black bear number two on shore, along with some eagles. Sunday we were once again up with the tide, in order to catch the last bit of ebb to get out of Port Neville. This is a fairly long inlet that packs a lot of current! 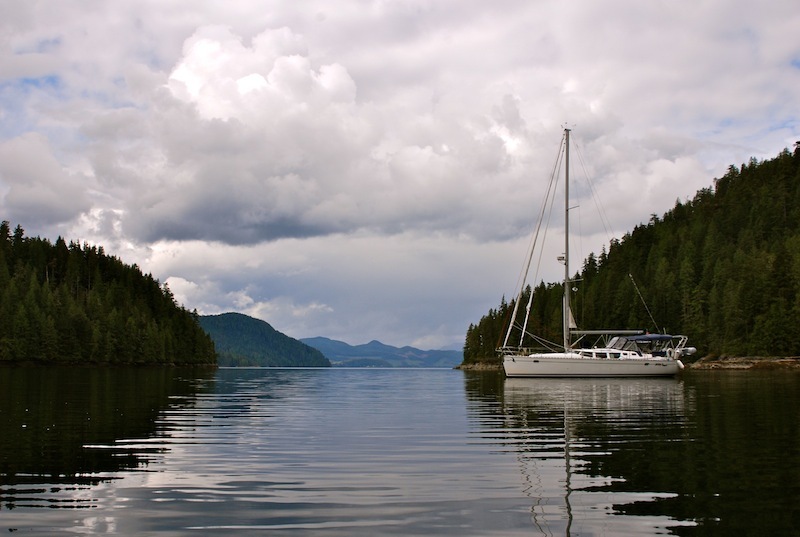 We zipped out on half power doing almost 8 knots, and headed up Johnstone Strait. Because it is a full moon, the tides have been extreme, causing all the logs on shore to drift off in the high tide. That equates to LOTS of flotsam and jetsam (a.k.a. logs everywhere). At one point we had to slow to an idle to push our way through the logs that were spread all the way across the strait…wild! We turned into Havannah Channel right on schedule at 9:10am, as we wanted to catch slack tide at Chatham Channel, a narrow, shallow channel between the mainland and Cracroft Island. 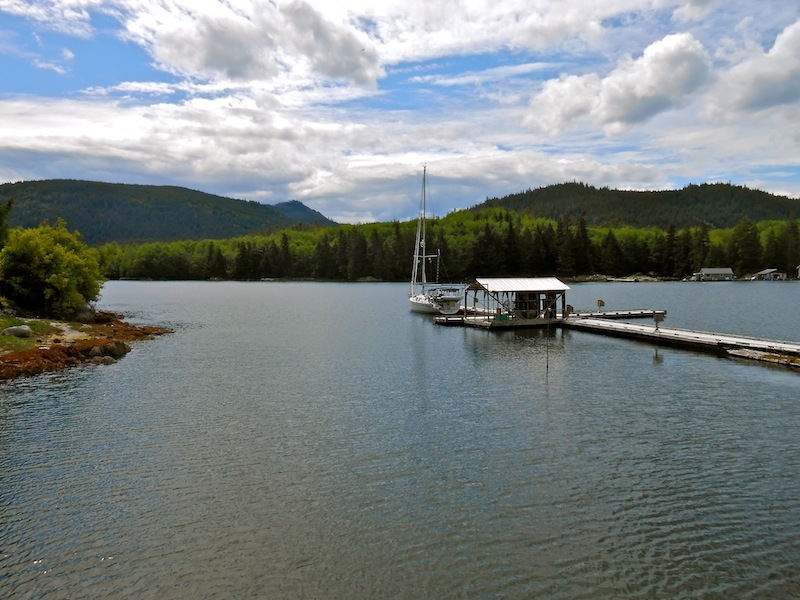 There are range markers at each end of the channel, and you must keep both ends lined up or you risk going aground. Marty watched the markers behind us and I watched the ones ahead, along with the depth sounder. All went fine even at low, low water! One more challenge met. Next stop, the Blow Hole! This is another narrow, shallow channel, but luckily for us it is named for the winds that frequently blow through, not the water! With no current to worry about, we simply had to miss the rock in the center and make our way through without running aground. After the crazy whirlpools, log flows, and tide rips of the past few days, that was a cinch! The “tool shed”! Lots of love went into building this place! We are definitely in the Broughtons now, where each marina is family owned, and is a special place created by very interesting characters. This place has tons of history, and lots of stories to be told. 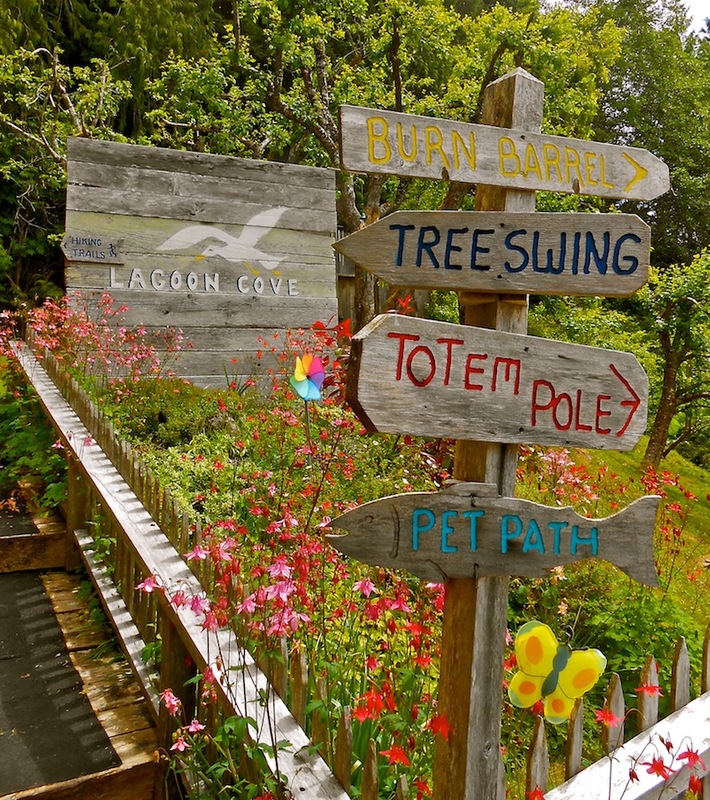 We’re excited to explore the archipelago, find some hidden anchorages and unique moorages! More to come!! ← Week 7 – Lund to Campbell River..to…Portland! Sounds perfect! We hiked(accidentally) with black bears in Jasper last summer. Stay aboard!! !